This is just for my own record-keeping. If you want to read an actual write-up of the year’s best songs, Kelsey McKinney has you covered here. Several formulations of Williams’s case suggest that the problem of integrity loss is one faced by a special sort of person, one who, like George, has a special commitment to a nonutilitarian project. But this seems dubious. For consider: either George takes the U-advice or he does not. If he does not, there is no suggestion of any integrity loss. If he does, then either he retains his special commitment to pacifism or he does not. If he does retain it, we have a clear loss of integrity, but it is the loss of the trivial sort just noted. If he does not retain his old commitment but abandons or significantly modifies it in an appropriate way, then there is no longer any gap between project and action. So if George is vulnerable to a nontrivial sort of integrity loss, either it is one that any consistent utilitarian must face or else there is some aspect of the conversion process that leads to the loss. For it is important to see that the utilitarian is not so much asking George to act against his continuing project as he is urging him to adopt a more utilitarian project. And this is just what George does if he comes to accept U-reasons as legitimate grounds for modifying his position. But it seems clear enough that the conversion process itself is not supposed to be the source of the alleged integrity loss. Intuitively it is implausible to hold that a mere change of moral beliefs damages one’s personal integrity. And, furthermore, Williams hardly mentions the matter of project change, except only to point out that a change in projects does not render one’s projects less morally significant. It is to consistent utilitarian belief and behavior that we must look for any loss of integrity. It’s hard to read Williams as being anything other than question-begging on this point. Standard caveats. Seriously, though, you guys, Mikal Cronin. This is probably hopelessly outdated, but back when I was more up to date with the hot new programming paradigms and the like, people liked talking about “web stacks,” with the archetypal one being LAMP. At the bottom you had the operating system (Linux), then the server software (Apache) on top of that, then the database software (MySQL) on top of that, and then the programming language that you write the site’s code in (Perl/Python/PHP, depending on your preferences) operating over everything. The vertical metaphor is useful for pretty obvious reasons. You can’t get much done writing a website with a given language without data in a database for your code to play with. There’s no point having the data on a server without server software with which to make it accessible to users. And you can’t run anything without your OS underneath it. Each layer needs the layers underneath it to do any work. I wonder if it’s useful to think about philosophical frameworks, or at least those which Rorty would have derisively categorized as “systematic philosophy,” in a similar fashion. At the bottom, you have metaphysics to tell you what stuff exists. Then you have epistemology on top of that to tell you what you can know about that stuff. Then you have philosophy of science (and of the various sciences, and perhaps philosophy of mind and language too) to tell how you can know the stuff that your epistemology says you can know. And finally you have practical philosophy — ethics, political philosophy, aesthetics, and so forth — to tell you what you should do in the world that the rest of philosophy has laid out for you. I don’t presume to speak for anyone but me, but this is certainly how I have usually thought about philosophy. And I’m starting to think, for reasons I touched on two years ago here and in part as a result of mulling of Matt’s response, it’s kind of mixed up. There is no necessary reason for the stacking to go in that order. Indeed, it might make more sense to make value theory foundational. 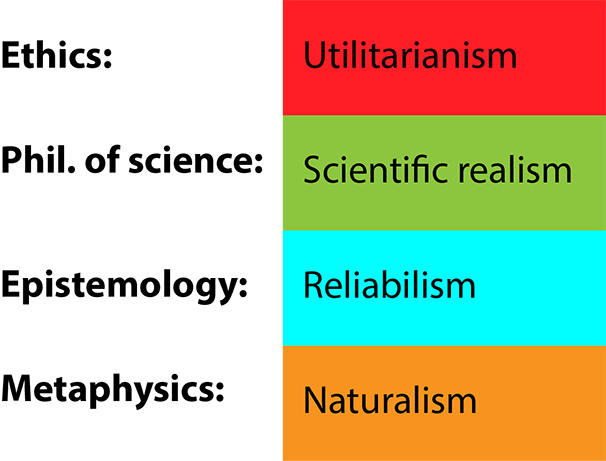 Instead of starting from the foundation of naturalism, someone who accepts this stack starts with his ethical theory — in this case utilitarianism, for ease of illustration — and moves from there. 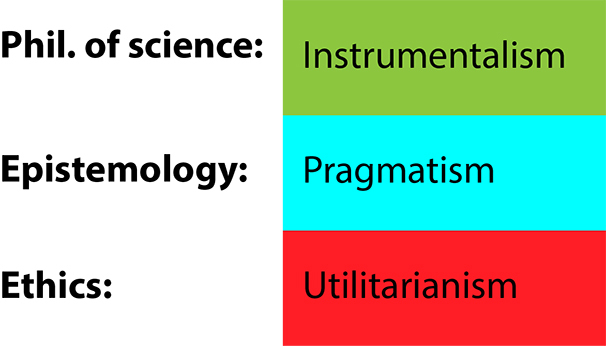 The question “what beliefs are justified?” is rephrased as “what ought I believe?” and so out comes a kind of pragmatism (“one ought to believe whatever beliefs maximize utility”) as one’s epistemological theory. And out of that comes an instrumentalism about science; it’s a tool for figuring out what’s best to believe, not a means of access to a mind-independent reality. And as for metaphysics — whatever! You don’t really need it. You have a pretty coherent picture of what one should do and believe and think about the world without getting into ontological matters. The obvious objection here is, “But how do you know utilitarianism is true?” From the perspective laid about above, however, this reply is sort of confused. Utilitarianism isn’t something you can know. It’s a precondition of obtaining knowledge. If to “know” something consists in believing what you ought to believe about a given subject, then you can’t explain how you know something without making reference to an underlying ethical (or at least normative) assumption about what’s best to believe. You can think about this as a kind of fideism about ethics. Just as theological fideists don’t think that it’s necessary or even wise to come up with reasons for believing in God, on this view you can’t come up with reasons to believe one ethical doctrine or another. All you can do is take your stand and see what follows. I don’t necessarily buy this view, though as you can probably tell I’m quite sympathetic to it. And one reason for that is that it avoids a difficulty that my previous post was trying to identify in the Cornell version of utilitarianism. On Boyd’s view, the answer to “should I perform action A?” is always “you should if A maximizes utility” except if action A is of the form “hold belief X”. Answers to questions like “should I hold belief X?” are more like “if belief X is verified by scientific methods and corresponds to the mind-independent world.” But why should this kind of question and only this kind of question be exempt from utilitarian reasoning? Isn’t it simpler to just junk the separate epistemological theory and start with the ethical theory as a foundation? Steve Petersen makes a persuasive case along these lines from an act utilitarian perspective here. As Petersen says, the burden of proof should be on value pluralists to explain why epistemic value is special and deserving of its own treatment apart from all other kinds of value. This challenge is particularly grave if, like Cornell realists, you think that epistemic value is the only exception to your view that one kind of value holds for all things. P.S. Paul Kelleher, who unlike me is an actual philosopher (with a PhD from Cornell, no less! ), notes that it’s probably fairer to characterize the Cornell folks as non-utilitarian consequentialists. D’oh. In any case, I think the above critique still applies.